The days of using candles or torches to light homes are long gone. Today, we simply flip the switch and light just… appears. But what happens between the time you flip the switch and the time your light bulb illuminates the room? 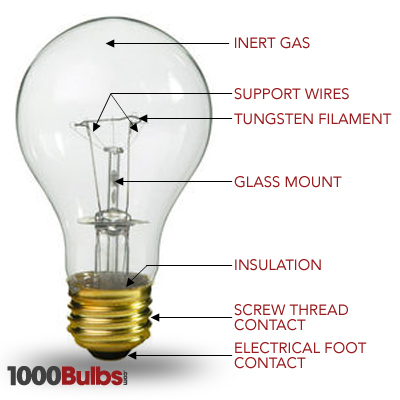 This week, we’re headed back to the basics: how an incandescent light bulb actually works. Think back to middle school science. Remember the terms “electron” and “nucleus”? Well, these two play a very important part in the science of lighting. Electrons, which are negatively charged particles moving around an atom, have different levels of energy, and are dependent on a few things, such as their speed and distance from the nucleus. Electrons have different levels of energy, and as a general rule of thumb, those with greater energy are farther away from the nucleus. The process of how atoms emit light is complex, but in simple terms, this is what happens: the atom collides with a moving particle, exciting the atom and causing an electron to jump to a higher energy level. When this occurs, the electron returns to its original energy level and releases this extra energy as a light photon. So we’ve given you an overview of how light is emitted, but what makes up a bulb? Fortunately, incandescent light bulbs have a pretty simple make up. Look at the picture of this incandescent A19 bulb to the right. Most incandescent bulbs have a medium base, which is just a fancy way of saying the bulb screws into a fixture. Notice the coil at the top of the glass mount. This filament is typically made up of tungsten metal. While the coil itself is only about an inch long, if you were to stretch the coil out, it would be a little over six feet long. Supporting the 6-foot coil are generally about 3-5 support wires, while a gas fills the bulb. Sometimes, Krypton gas is used to extend the life of the bulb. Now that we’ve covered how light is created and what makes up a bulb, it’s time to look at what actually happens when you flip the switch. Electricity flows from the contacts to the filament, and while the current is coursing through the wires to the filament, the electrons constantly collide into the atoms that make up the tungsten filament. Due to these constant collisions, the atoms that make up the filament vibrate (simply put, the electric current heats up the atoms), causing the bound electrons in the vibrating atoms to be temporarily boosted to higher energy levels. Once these electrons release their extra energy as photons, they return back to their original energy levels. Keep in mind that incandescent bulbs are very energy inefficient. In fact, 80 percent of their energy is released as heat, while only the remaining 20 percent is given off as actual visible light. Want to know how something else works? Let us know on Twitter, Facebook, or Google Plus!